When the Maloofs graciously accepted $535 million from an ownership group led by Vivek Ranadivé, it meant Sacramentans could stop worrying about their hometown team being wrested away, and get back to just watching the Sacramento Kings play. On the other end of the size spectrum, Isaiah Thomas continued punishing every team that made him 2011's "Mr. Irrelevant," averaging 20.3 points and 6.3 assists per game and trailing only Chris Paul, Russell Westbrook and Stephen Curry in PER among point guards. 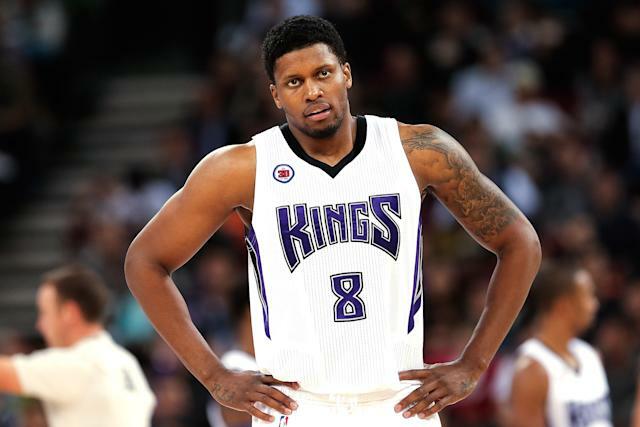 A midseason trade for Rudy Gay worked out way better than most expected. There was a slight but measurable defensive improvement under new head coach Michael Malone, who earned a strong reputation on that side of the ball while an assistant in Cleveland, New Orleans and Golden State. 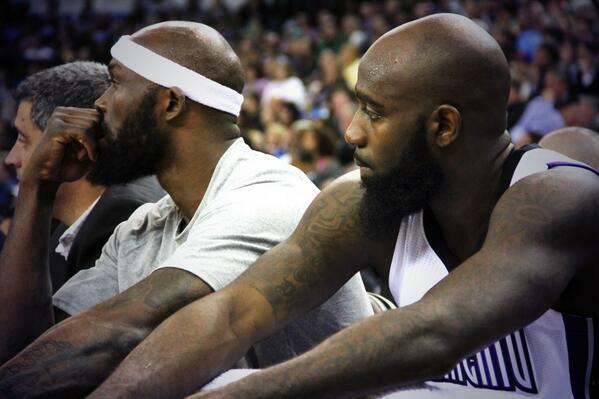 Quincy Acy and Reggie Evans had great beards. There were also losses — 54 of them, same as under Keith Smart in 2012-13 — plus an offensive decline and, after trading Greivis Vasquez, Patrick Patterson, John Salmons and Chuck Hayes in the Gay deal, scant second-unit support. Cousins kept acting as the league's enfant terrible; rookie Ben McLemore was just plain terrible. High-priced addition Carl Landry missed 52 games with hip and knee injuries. The book finally, frustratingly, closed on Jimmer Fredette, and opened, frustratingly, on Derrick Williams. Jason Thompson played 2,007 minutes. Few noticed. After a season more notable for myriad virtual experiments than anything tangible, the Kings are determined to change Sacramento's status quo. Boogie had a solid summer with Team USA and promises to be on his best behavior. With a new arena slated to open in 2016, the new leadership believes it's time to start winning. "We want to make the playoffs, that's our goal here," general manager Pete D'Alessandro told SB Nation's Paul Flannery. "We always say we're trying to get there faster rather than taking the slow route." "Faster" apparently means "positionless" ball in which players play multiple roles, giving Malone the flexibility to go small or huge, depending on matchups. Sounds great in theory; in practice, it'll all fall apart if Malone's players still struggle to play one role, let alone a bunch of them. "I really love how hard our guys are working right now," Malone told NBA.com's Scott Howard-Cooper. "We're competing. But at some point, we have to execute." Will the Kings reach that point this season? Or will all the changes just result in a seventh straight season of fewer than 30 wins? We're not good, but at least we're still here. Our coach is feisty! New arena coming! So much freakin' Boogie! Whatever NBA 3.0 means! Not really. The Kings' big offseason move seems to have been downgrading at the point, signing Darren Collison (last seen performing admirably enough as a reserve on the Los Angeles Clippers) and allowing Thomas to join the Phoenix Suns. Swapping a good starter for a decent backup, whom you then make a starter, doesn't seem destined to make you better. "We think the world of Isaiah and his talent is unquestioned," D'Alessandro says. "No one said, ‘Isaiah can't play.' We all think he can play. The end result was 28 wins for us. That's not Isaiah's fault, DeMarcus' fault, Rudy's fault. All I know is you can't come back with the same thing year after year and just expect it to happen. This league is about making decisions and so we did." With Cousins entrenched as the franchise cornerstone and Gay back after picking up his $19.3 million player option, Thomas was the odd man out. It remains to be seen whether sacrificing production for fit will improve Sacramento. I'm skeptical. Joining Collison in the backcourt are 2014 lottery pick Nik Stauskas, whose shooting (44.1 percent from beyond the college arc at Michigan, 36.8 percent from deep during the preseason) and playmaking should earn him playing time right away, and well-traveled table-setter Ramon Sessions, whose addition on a two-year, $4.2 million deal seems like a late-in-free-agency steal. The 6-foot-10 Moreland averaged 2.1 blocks in 26.1 minutes per game over his final three years at Oregon State and impressed with his shot-blocking at Summer League. But expecting the undrafted rookie to play a major role in solidifying a woeful interior defense — no team allowed a higher opponent field-goal percentage in the restricted area than Sacramento last year (65.1 percent) — seems a bit too much. A vet-heavy frontcourt means Moreland's more likely to contribute to the Bighorns than the big club. D'Alessandro also brought Casspi back to be a steady wing off the bench, and made a pair of minor trades. The 26-year-old Israeli offers some versatility at the three and four, and the deals kept Sacramento clear of the luxury tax while landing a $5.85 million traded player exception, which could prove useful should the capped-out Kings find a trade worth making this year. If you think that looks like a lot of shuffling deck chairs without much, or any, substantive improvement, you're not alone. But D'Alessandro remains bullish, preparing I-told-you-so's while insisting that one day it'll all make sense. But has that thinking raised the ceiling for this year's Kings? I don't see it. It could prove to be Dean Oliver, one of the forefathers of basketball analytics, whom Sacramento added to its front office this fall. For now, though, it's Collison, who must make this starting job stick after his last two tries — in Indiana Pacers, where he was supplanted by George Hill, prompting a trade to Dallas, where he was demoted in favor of Derek Fisher and Mike James — didn't go well. He's not as explosive an athlete and driver as Thomas. Nor is he as creative a playmaker and finisher. But Collison did produce when pressed into starting by injuries to Paul, averaging 14.8 points, 5.3 assists and 2.8 rebounds in 33.8 minutes per game over 35 starts last season. His shooting splits rose across the board as a starter, and his .605 True Shooting percentage — which takes into account 2-point, 3-point and free-throw accuracy — would've tied for the NBA's seventh-best mark over the full season. Part of that's owed, certainly, to sharing the floor with the attention-drawing likes of Blake Griffin, DeAndre Jordan and J.J. Redick when replacing Paul. But it's not like defenses will be leaving Cousins and Gay alone, either. If Collison can drill from distance — last year's 37.6 percent mark from 3 was his best since his rookie season — he could offer an important boost as a spot-up floor-spacer for a Kings offense that ranked 26th in 3-point attempts and 27th in 3-point accuracy last year en route to a bottom-10 finish in offensive efficiency for the fifth time in six seasons. Many of the justifications offered for adding Collison — he's a pass-first point guard who looks to create for others rather than for himself; he's fast with the ball in his hands and will push the pace; he's an impactful defender who can hector opposing lead guards — have been picked apart by stat dives ("Collison was actually slightly more inclined to shoot than to create for teammates than was Thomas," "The Kings with Thomas on the floor played at a faster pace than the Clippers did with Collison") and tape review ("defensively he's good for one thing: the aforementioned peskiness on the perimeter and in the lane [...] the rest of the time, he's a sieve"). But the numbers do suggest Collison doesn't pound the rock like Thomas, which could help facilitate motion in the half-court. It's unlikely Collison will be better this season than the player he's replacing, but it's possible, as Sactown Royalty's Greg Wissinger writes, that he'll "fit into [the Kings'] team concept better." If he underwhelms, though, he'll find himself in a timeshare with Sessions or even ceding his starting gig again, making all those naysayers into soothsayers. Defense. Sacramento hasn't had a better-than-league-average D since Ron Artest and Bonzi Wells wore purple. Precious little about the Kings has been stable in recent years, but you could always rely on being able to score on them at will. Things got a bit better under Malone last year, as the Kings nudged up to 23rd in defensive efficiency after finishing 28th in '11-'12 and 29th in '12-'13. Cousins showed greater focus and effort on that end, starting to bolster his spotty reputation. But taking a great leap forward in a brutal West without an elite O requires at least a middle-of-the-pack D, and it's difficult to see Sacramento approaching even that modest goal. Front-office spin aside, neither Collison nor Sessions are likely to be significantly stouter than Thomas. McLemore was roundly torched as a rookie, and Stauskas, for one reason or another, will be tested, too. Which King would you trust to slow down an opponent's top perimeter scorer? Gay? Casspi? Williams? 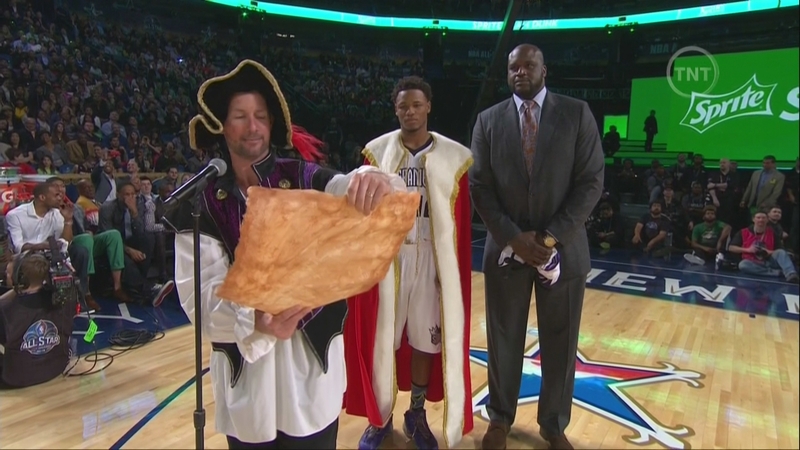 An augmented-reality Doug Christie hologram? With Cousins, Thompson and Evans on hand, Sacramento should continue to rank among the league's best teams at cleaning the glass after defensive possessions that end in a miss. Forcing those misses, though, figures to remain a struggle. Cousins must prove he's more than just a "good stats on a bad team" guy. Collison has to prove he's really the man for the job. Thompson, as seems to be the case every season, has to prove he's worth keeping. Williams, still just 23, has still yet to realize the potential that made him 2011's No. 2 pick. McLemore has to prove last year's struggles were mere rookie growing pains. 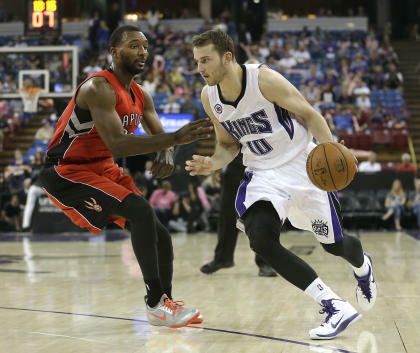 Stauskas has to prove he can hold his own against wings with NBA athleticism. On a roster with plenty to prove, though, Gay stands out. After becoming stat-heads' favorite whipping boy and the poster child for the kind of contract that kills you in today's NBA — superstar money for not-quite-All-Star production — Gay responded to his second straight midseason trade by playing arguably the best ball of his career. The former UConn star averaged 20.1 points on 15.3 field-goal attempts in 34.4 minutes per game after coming to Sacramento, shooting a career-best 48.2 percent from the floor. He shot fewer 3-pointers than he had since his last full season in Memphis and got to the free-throw line more often than ever, while assisting on a career-high share of his teammates' buckets. The "usage theory" floated by SB Nation's Tom Ziller — that Gay's efficient when he ends less than a quarter of his team's possessions by taking a shot, drawing a foul or turning it over, and inefficient when he "uses" more than 25 percent — largely bore out; he clearly thrived when freed from the responsibility to be the Kings' top scorer. With Thomas now in Phoenix, though, Gay — who averaged six points, 3.7 rebounds and 1.4 assists in 14 minutes per game as a late addition to Team USA's World Cup roster — will move up the pecking order. He'll get more touches on the block and perhaps as a secondary facilitator in pick-and-rolls, but could also see more of those sinful ol' wing isolations. If he avoids falling back in love with low-possession, late-shot-clock jumpers and proves his post-trade work wasn't a 55-game mirage, he could set himself up for a monster payday in free agency next summer. If he can't, though, the league's thinking could swing back to the notion that Gay's something of a relic — a collection of skills celebrated two decades ago that now mark him as the star that time forgot. After averaging 13.5 points and 6.8 assists a night over the final 12 games last year — albeit on an absurd 42.2 minutes per game, since the Kings basically had no other healthy point guards by late March — I liked Ray McCallum here. But then D'Alessandro signed Collison and Sessions, impeding the 23-year-old's path to significant minutes, which leaves McLemore, whose rookie season was about as underwhelming as that "Shaqlemore" thing. Selecting Stauskas at No. 8 this June doesn't mean the Kings are ready to move on after just one season, but it does serve notice that McLemore won't be able to get by solely on his draft position for long. He's reportedly worked on tightening up his handle this offseason, his shot showed signs of perking up in preseason (8 for 18 from deep) and he's got the quickness and springs to be a dangerous finisher in transition if Sacramento does push the pace. If he can become a more confident shooter and ball-mover while applying his athleticism on defense, he could solidify his spot as a building block for a Kings team intent on improving fast. If he can't, he could find himself eclipsed by Stauskas and left behind before he's even had the chance to take off his robe. Cousins curbs his overenthusiasm and becomes an offensive dominator who generates not only All_Star votes, but semi-serious MVP consideration. Gay continues to produce as a second banana. Collison and Sessions combine to make one very good point guard, McLemore and Stauskas combine to make one very good shooting guard, and the Kings finally start shooting straight. A healthy Landry becomes a second-unit focal point, Williams reminds us why we thought he'd be a monster, Malone MacGyvers a middling defense and Sacramento hits .500 for the first time since Rick Adelman left. Boogie can't stop self-destructing. Gay turns back into a pumpkin. Collison stinks, Sessions offers a mediocre replacement and Thomas wins Sixth Man of the Year for the playoff-bound Suns. Malone can't get anything consistent out of McLemore, Stauskas or McCallum, and the rest of the Kings bench underwhelms. After a seventh-straight sub-30-win season, Ranadivé and D'Alessandro give Gay a four-year, $60 million deal. The honeymoon's over. 35-47, the team's best mark since 2008, but still only good enough for 12th in the West.